I was amazed to learn this week that a UK firm, one that is a major user of technology to deliver its services and a large employer of millennials … bans its staff from using social media during office hours. It got me thinking. Given that increasingly this age group (and younger) are accessing so much, from sales leads to networking opportunities … if firms are imposing such bans – are many leveraging the potential hiring power that social platforms can deliver? I selected ten firms who I follow on Twitter – firms who use social media to try to sell me their product and investigated how well they are using social platforms to attract talent. Only one of the ten seemed to have an effective social media recruitment strategy. Let’s be clear, I’m not talking about just tweeting that you have an opening. That’s potentially going to be as effective as an old-fashioned job ad. Clearly, you will still get better results with a recruitment partner who will write bespoke adverts focussed on candidate attraction to match your business or company culture and sell your business as a great place to work. Your social platforms can help as part of the mix but it’s more than posting #jobad and hoping for the best. What I’m talking about here is creating a presence on social media that singles you out as the best place for IT Talent to work. It’s about projecting a culture, under the radar, that will attract talent with digital skills. Talent who, nowadays, can pick and choose where they work. Here are five thoughts on how you could use social platforms to complement the work of your IT Recruitment partner. Only one of the firms I chose in my survey did this. I read a blog from an IT Project manager about how he and his team had collaborated to solve a significant challenge. As I read the post I got a sense of the kind of meaty challenges that they faced, the creative way that they approached them, the true sense of teamwork and togetherness, the difference that they had made to their customer and the recognition that they got from their company bosses. It sounded like a fabulous place to work and it would have made me likely to keep an eye out for any opportunities that come up there. They weren’t advertising a job but they made me want one. Using social media to report industry trends, for example, helps you stay in touch with candidates on a more regular basis. How many firms do you follow on social media who are a bit anti-social? They seem to use their Twitter account like a loudspeaker to shout corporate messages at you. My timeline is full of them and I wouldn’t want to work for a single one! When you truly engage with current and potential customers you create a perception that yours is the kind of company that would probably engage with its current and potential staff. Certainly, a firm that worth applying to work for, should an opportunity arise. For example, one company that I follow has its Twitter feed regularly manned by managers answering questions. Now, none of it is employment related but it leaves you with a definite sense that here is a culture of integrity and openness that you imagine would be a really cool place to work. Nine out of the ten companies I looked had a very safe social media offer. They were beige! I know for a fact that one of the companies had just completed a charity abseil … but there was no mention of it on the firm’s social media channels. This kind of extracurricular ‘make a difference’ type of activity can be really appealing to certain talent who have a Steve Jobs ‘make a dent in the Universe’ attitude. Like with most things, you will reap what you sow. The more active you are on social media (LinkedIn, Twitter, blogs, etc) the more awareness you will gather and the more effective your recruitment efforts will be. It is essential that you talk in your ‘company voice’ – your online personality should be a mirror of the feeling that your business gives to its clients and visitors. Measuring activity, authenticity and consistency will help create a brand image that will attract culturally aligned talent. Your employees are going to use social media. So are your potential employees. You should get to know the content that they habitually engage with and share as a professional community and identify and encourage the sharing of company related areas of content – like success stories, great change projects that they were involved with, or big contract wins. This, in turn, creates an awareness of your business that makes you more attractive to potential talent who may otherwise never have heard of you. Then, when you advertise your position potential candidates already have an idea of why they’d want to work with you from the ‘testimonials’ of their fellow professionals – your existing employees. You should acknowledge best practice in this area! The company that I mentioned at the start, the one that banned social media during office hours, did so because they are afraid that any posts by staff may reflect negatively on their brand. If someone says in their profile that they work for you and during the hours of nine to five they post something controversial it could be attributed to you. Really?! OK, occasionally someone may post something negative about your company. We all have bad days. We all have days where the job stinks! Some people take to social media to vent and that could put off potential candidates. The best way to deal with this kind of thing is quickly and decisively. Be proactive! You should run regular training on the consequences of social media bad practice … but don’t ban it altogether. Recruitment can be an incredibly frustrating process but you can make life easier with the right recruitment partner and an effective narrative on social media. 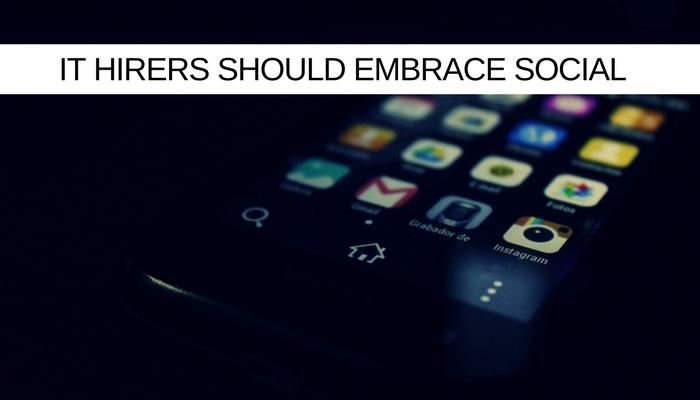 You can ensure a cultural ‘best fit’ and sell your business as a great place to work but social media is not a replacement for other recruiting processes. It is a useful addition and an enhancement, another tool in the toolkit and like most tools, knowing how to use it will get better results.